This month, we’re pleased to introduce you to another one of our Uganda outgrowers, John Tuhamize. 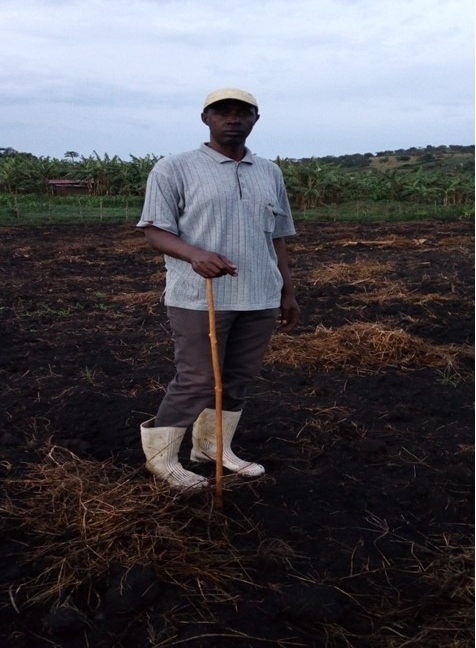 John currently resides on his family land, a 1.4 acreage near the World Food Bank’s Mbarara Farm. He is married to his wife Hope and together they have five children, who are all grown. John’s main livelihood has been raising livestock, and while he has always grown crops on his land, he has struggled to make a good living from it due to a number of factors. First, John says that he has lacked the right knowledge about successful farming techniques. Though he has tried to grow several crops, most have failed because he hasn’t had access to education on soil health, seeds, crop rotation, and best practices for harvesting. When he has had crops to harvest, John says he struggled to get them to market efficiently. Even when he did, he found the price volatility and market instability to be lacking, and he rarely made good profits on his yields. Now, John says he is hopeful that this will change with access to the World Food Bank’s programs and expertise. Landing this role as an outgrower could not have come at a better time, and he looks forward to growing the productivity of his land and being able to provide more support to his family.